What does it really mean to be free? Is it just the ability to eat where and when I want? Is it the ability to go where I want, to watch whatever show on television that I want, or just to hang out with friends? To a large degree, it would be safe to define this as freedom. However, Eastern wisdom tells us that even those who have the freedom to engage in all the activities mentioned above are imprisoned. They are prisoners of their mind and senses. The Bhagavad Gita, the most prominent spiritual text from India explains that we are not the physical body made up of matter. Rather, we are a spirit soul living in this body. Our imprisonment is our forgetfulness of our true identity, which is causing us to identify ourselves with the material body. It’s a very difficult paradigm to digest, even if you were raised with a belief in the soul. Basically, it’s telling us that when we’re looking into a mirror, we’re not seeing the real person. We’re only seeing the exterior covering. The real person is sitting within the body. The body is often times described as a vehicle and the soul as the driver. A vehicle can’t function without the driver. The soul is seated in a vehicle made not of metal, but of flesh and bones. The eyes are like the headlights and the arms and legs like the wheels, which allow for motion. The soul is the spiritual spark that creates consciousness. It can also be said that it is consciousness. Without the soul, the body is just a lifeless lump of matter that starts decaying and loses all attractiveness. We have to admit that no matter how close we were to someone, once the soul leaves the body, we’d prefer not to hang around the body for too long. Recognition of our spiritual identity doesn’t translate into indifference towards one’s own or others’ bodies. The body is a very important vehicle. It can’t be neglected as it serves as the vehicle for the soul and it takes the soul to its next destination. That destination can either be another material body or liberation from the cycle of birth and death. The other reason, everyone is considered imprisoned is because we all have a mind that is completely out of control. Hinduism suggests that one cannot be considered a free person, unless they have control of their mind and senses. The mind lives within us and controls our thoughts, emotions and actions. We go to sleep with it every night and we wake up with it every morning. If we’re going to spend that much time with someone, doesn’t it make sense to develop a friendship with that individual? The Bhagavad Gita says that the “mind can become one’s best friend or worst enemy.” Too often it’ll force us to act in ways that are detrimental to our physical, emotional, and spiritual health. So, Hinduism implores us to make self-realization and God realization the primary goal of our human life. Meditation, prayer, and acts of devotion to God can purify the heart and mind of envy, greed, pride, and anger. Unless these tendencies are removed from our consciousness, there is very little possibility of character reform. It will take commitment and serious dedication to realize that we are not the body or mind and that we are actually servants and friends of the Divine. Spiritual freedom means to reestablish our relationship with the Divine which is the only true source of happiness. Pandit Dasa is a hindu chaplain at New York University and Union Theological Seminary. 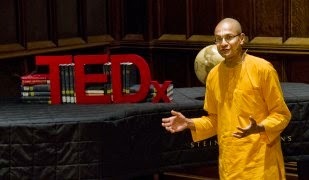 Pandit is an author, meditation teacher, inspirational speaker, and lecturer at Columbia University. He has spoken at a TEDx conference and has been featured on PBS, NPR, NY Times, and writes for the Huffington Post. He has spoken at Google, Bank of America, Intel, Novartis, Harvard, Columbia and many other institutions.